Genius Loci Games: Quick Note - The Gifts of the Frog Gods! Got my Frog god gift box in today. I picked up the $30.00 box for mainly financial reasons but I am impressed by what I got. 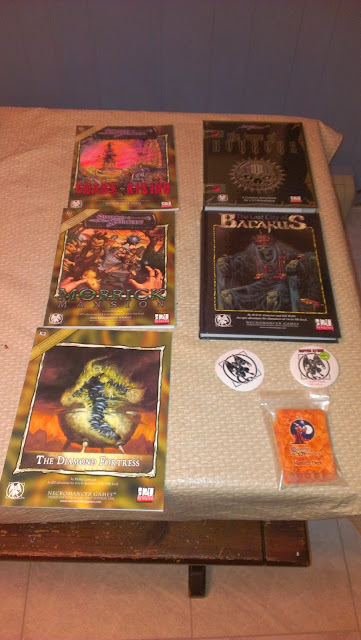 A lot of old Necromancer Games stuff for 3rd edition. I had my fingers crossed for more S&W type stuff but still great haul for $30.00! If any of you haven't looked at Erik Tenkar's post about this than I suggest you either do that or head right over to the Frog's site for the deal! Also I bet I'm the reason for the big red text message at the top of the page. My apologizes +Bill Webb and the rest of the Frogs!